Joining Ginny for this weeks Yarn along again: As you can see the number of hexipuffs is growing ever since Week 2, the carpet is now twice the size it was last week even though it doesn’t really show and the cardigan has grown too but not as much as I hoped. I’m still knitting the back part. So not much new. But I started making another pair of knit-felted slippers but this time without the high ankle part for male guests, because Michael was asking for a pair of slippers for his friends when they come over in winter and should take their shoes off in the flat. I also started ripping his Christmas cardigan to redo it completely because it so didn’t fit at all. And I’m ripping an old sweater from the 80s that used to belong to my dad. It has a very nice and fluffy greige with little colour spots on the upper part and I’m ripping only that to reuse it for hexipuffs or, depending on how much I will get out of it, something else. 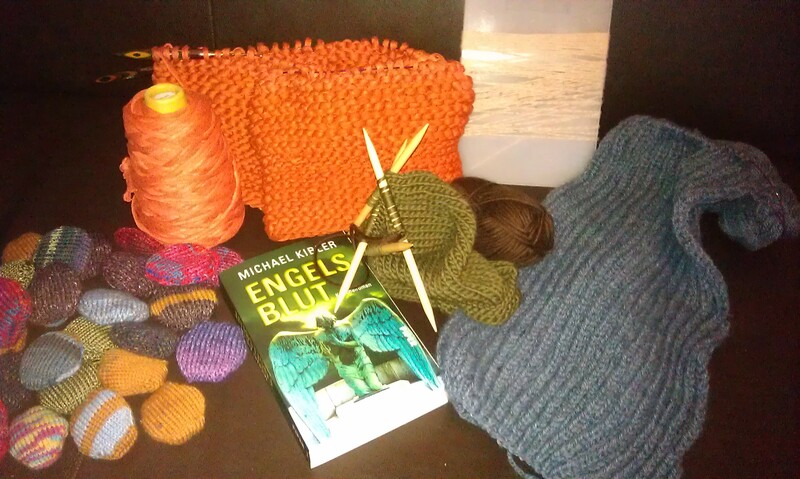 And I finished my first novel in 2013 and am now reading the second christmas present book: Engelsblut by Michael Kippler. It looks a quite tacky but that is only the cover it is a very solid detective story situated in my hometown Darmstadt. This entry was posted in Knitting & Crocheting and tagged Cardigan, Carpet, Hexipuffs, Knitting, Slippers, Yarn Along by kathatravelling. Bookmark the permalink. Thank you for the book tip, ich moechte mehr Deutsch lesen, und Spass haben dabei!